Since the fifties and actually until today it is a beautiful tradition that the most famous singers, who shone on the opera stage and the concert podium (early also still on the operetta scene, today in the crossover compartment), made their fans happy with a Christmas record at some point. Whether the popular music from Elvis, Doris Day, Frank Sinatra and Ella Fitzgerald to Natalie Cole, Barbra Streisand, but also Nana Mouskouri, Roy Black and Peter Alexander has been copied by classical artists - or vice versa, who can still prove it today? In any case, the composition of these Christmas records, from the traditional European song selection and the careful orchestral arrangements to the trendy world music mix, is always a faithful reflection of their time and the prevailing taste. Some things may now be smiled at as sedate, but who knows how future generations will react to today's trendy Christmas mixes? 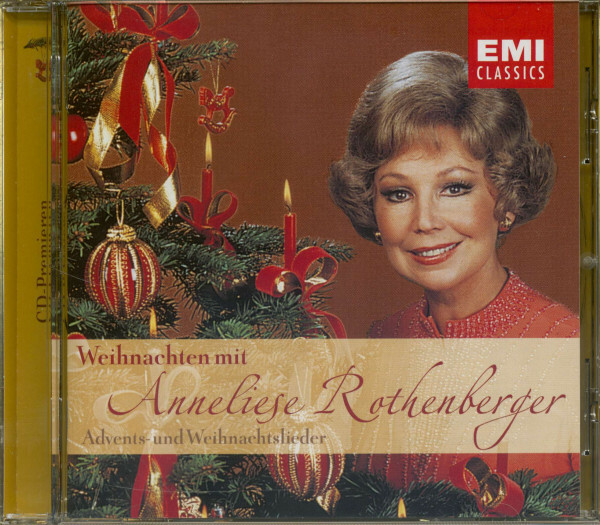 Just as Erika Koth, Rita Streich and Elisabeth Schwarzkopf sang their Christmas records, Dietrich Fischer-Dieskau and Hermann Prey, it could not be excluded that an artist as popular and versatile as Anneliese Rothenberger could hang her sounding Christmas tree ball on the imaginary Christmas tree. And three times! Certainly also proof of the fame and popularity of the Mannheim native, born in 1926, who shone as one of the most famous and charming sopranos of her ara, not only from Hamburg to New York, but especially in the magical opera triangle between Munich, Salzburg and Vienna, as Sophie im Rosenkavalier, Pamina, Konstanze, but also Bergs Lulu and in the world premiere of Rolf Liebermann's Penelope and in its Moliere-Vertonung Die Schule der Frauen. On such a solid foundation a versatile (record) career in operetta could develop, but also her various classical TV shows, which made her a beloved media star with a broad audience, could count on high ratings. The famous Electrola producer Dr. Helmut Storjohann gave the green light for a Christmas record à la Rothenberger for the first time in 1967. In the Lenggries parish church, in addition to the sensitive singer Gerhard Schmidt-Gaden's highly esteemed Tölzer Knabenchor and the Graunke Symphony Orchestra from Munich, which is very busy at the Electrola, gathered to play a selection of classical Christmas and Advent songs, ranging from the baroque "Es kommt ein Schiff geladen" to the Austrian folk song "Dös Allerschönste Kindl". Some were performed unaccompanied, some with harpsichord, organ and recorder added by Electrola recording director Christfried Bickenbach orchestrated atmospherically, they alternated charmingly on the finished record with the cosy sound of old music boxes. The clear, intimate voice of the Rothenbergers, of course, overshines this, who also struck exactly the right note here with an unmistakable taste. The second sounding Christmas plate with Anneliese Rothenberger, again produced by Storjohann, was recorded in 1981 under the direction of Leopold Hager with the Vokalensemble Marburg, the Kölner Kinderchor and the Symphonieorchester Radio Luxemburg in Luxembourg. In large arrangements by Willy Mattes, who was even awarded an Edison Prize for his orchestral arrangements, Anneliese Rothenberger sang the most famous German Christmas songs from 0 du merrliche über Stille Nacht to Joseph, dear Joseph mein. The economic miracle was over, you were like-who. The intimate intimacy was followed by the brilliantly representative splendour of the songs. This too - an expression of his time. But still fresh and fresh as a nostalgic memory - and another pretty facet that makes the astonishing Gesamtkunstwerk Anneliese Rothenberger richer. 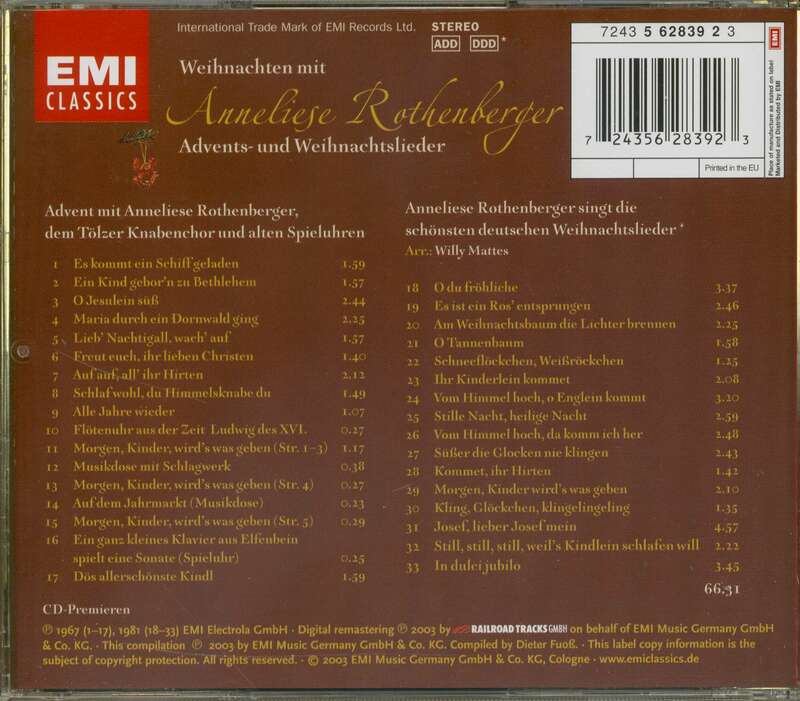 Customer evaluation for "Weihnachten Mit Anneliese Rothenberger (CD)"